Elyse is one of my favorite wineries when it comes to reasonably priced, larger framed, red wines. Elyse is usually our first stop when we visit wine Napa, and we have been known to stop again before we head home. We love all their red wines and their Petite Sirahs have always been top notch. I highly recommend stopping by if you ever find yourself in Napa and want to avoid the usual high traffic areas. The winery is not far off of Highway 29 just north of the city of Napa before you get to Yountville. You’ll thank me later. 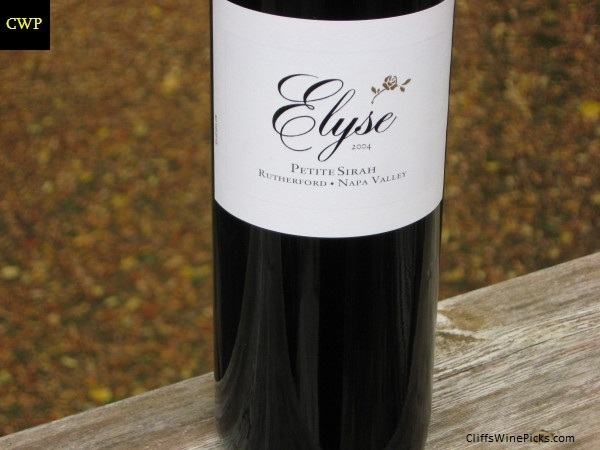 NapaValley’s Elyse Winery has two causes for celebration this harvest. In addition to a stellar looking 2012 vintage in NapaValley, it is the 25th harvest for the winery. It was back in 1987 that Ray and Nancy Coursen crushed 4.5 tons of Zinfandel from the Morisoli Vineyard in Rutherford to craft 286 cases of their first wine. While the portfolio has grown over the last 25 years, the focus remains on creating vineyard driven wines that pair well with food. Total production is currently 10,000 cases and the wines are nationally and internationally distributed. 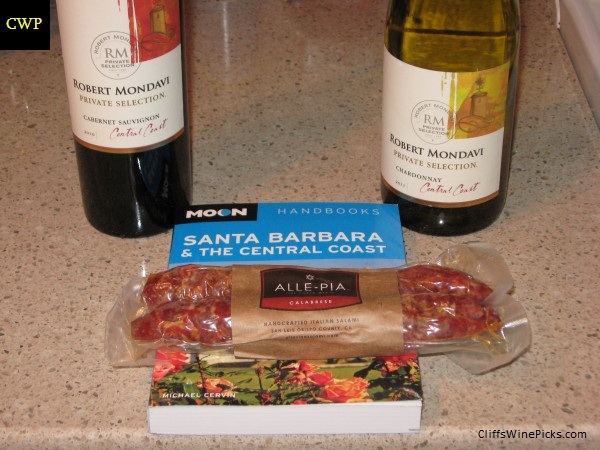 A quick stop at the local UPS Depot netted me a couple wine samples from Mondavi, a book, salami, recipes and other swag. These bottles will be featured in a future blog posting, but I don’t think the salami will make it through the weekend, it looks good! Another bottle from my stash of aged Rieslings. This one is from the Alsace region in France. I had a bottle several months ago and with a touch of air and warming up a bit, it was outstanding. I may give it a quick decant to help it shake off the cobwebs and warm it up a touch since that helped last bottle. We love older Rieslings, but I have far more experience with ones from Germany. I couldn’t find too much information on the winery to do with their history. When we get a chance to acquire a wine with this age and this level of provenance we jump in head first. I originally inquired about this wine after tasting it at a dinner last winter in Strasbourg where a local collector was trying to showcase the best unknown producers in Alsace. I couldn’t find any at the winery but I found a few bottles at a local retailer and was told he had access to three more cases that were lying in the winery cellar as a library release. I inquired again at the winery and due to persistence was told there were “a few cases” but no more. I visited, tasted the wine again and walked through the cellar where I found a stash of this, unlabeled and full of the typical dust and mold one finds in decade-old bottles resting in a cave. I asked if indeed there were more than “a few” cases available and indeed there were (remember, this started as “nothing available”, “a few” and now “more than a few” – such is the nature of my job, gentle prodding that can seem determined to many Europeans but the results are in your cellar). Hand-picked and hand made, this is an esoteric bottle of wine that contains a mystery of flavor and stony but honeyed Riesling fruit that is strong but medium in weight and beautifully balanced. It is just starting to mature and open and its best days are well ahead of it. Klein is known to have some of the longest-lived examples in Alsace (even the Trimbachs are fans) and 1980s examples are still going strong (even an early 1990s Muscat tasted was magical). 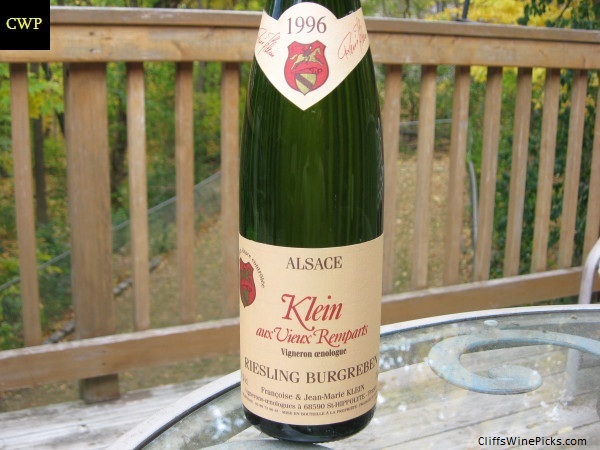 The Klein Burgreben reminds me of a junior version of Boxler’s Riesling “Brand” from the 1996 vintage (or even Tempe’s 1998 Burgreben which is quite close) and I liken this offer to one of the Schloss Schonborn deals we had over the winter – cellar stock that is in absolutely pristine condition. While we have the opportunity, I urge you to partake of this shimmering, lightly golden elixir – it’s just a great bottle of terroir-focussed Riesling (this time dry), directly from the winery cellar and never moved since bottling. The wine was just labeled on your behalf a week ago and sent on its way to us. For this price it makes a mockery of many of the world’s current Riesling release offers. This is another mailing list only wine that I was fortunate to join before they started getting high scores from the wine publications. The “rock star” winemaker, Helen Keplinger is now the winemaker for the “cult” winery, Bryant Family, which appeared to be a bit outside of her normal “comfort zone” since she made her name and honed her talents working mainly with the Rhone varietals. I bought several bottles of this wine, but have been patient long enough, one gets popped tonight. After Davis, I worked with Heidi Barrett, Kathy Joseph, consultant Claude Gros, and David Abreu. Since 2004, I have been the winemaker for some exciting projects, including Cellers Melis (Priorat), Kenzo Estate, FortRoss, Sarocka, Scully, and Arrow & Branch. I am currently focused solely on Keplinger Wines and Bryant Family Vineyards. About a half bottle was recorked and left on the counter. The next day the tannins had integrated and lost the dryness. The fruit has also come to the forefront and has pushed the still present savory notes into the background. The wine is now much smoother and polished. Leave these in the cellar of give them a ton of air. I’m in the mood for a nice Bordeaux. 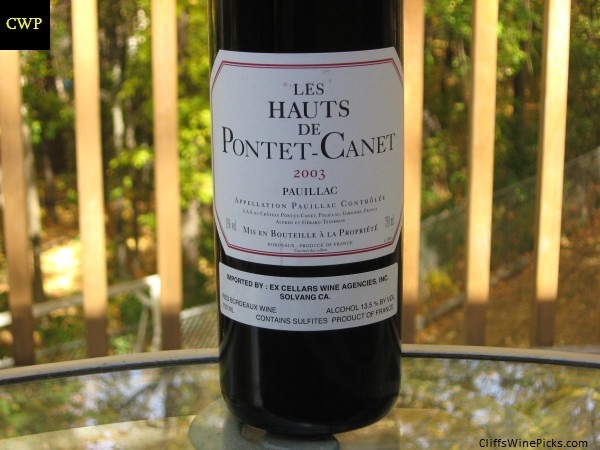 I saw my stack of 2003 Pontet-Canet but decided it was WAY too early to open one of them. Then I remembered I grabbed a few of this, their second wine. This should be at least getting close to a nice drinking window, so one get opened later today. I’ll probably open the bottle later and decide if it needs decanted or if it’s ready to rock. The mailing list season is just about over. There may be a few stragglers or lists that are looking to move a few less popular bottles, but for most of us, it’s “Shipping Season”. Shipping Season is that glorious time of the year where generic cardboard boxes arrive, and like kids at Christmas, we rip into the boxes. Nice note on the Keplinger. I’ve yet to try any of these wines. Definitely need to rectify that. 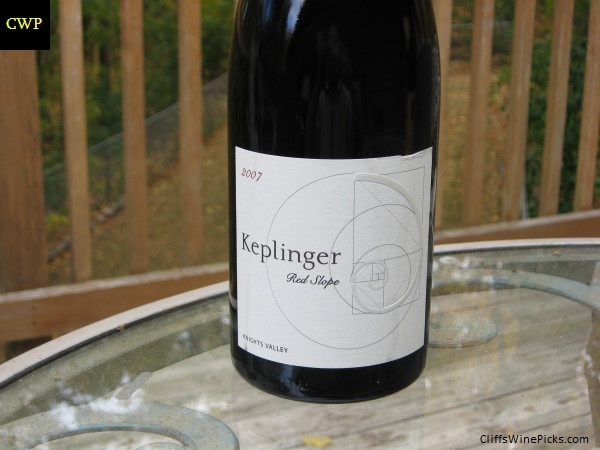 The Keplinger was still very young but based on how much the wine improved on day 2, this will have a long life.